JPY 387,720/booth (1booth = 9m2) Reserve more than 10 booths SAVE up to 10% !! JPY 21,600 per corner An additional charge is applied for every main aisle that is exposed to the aisle rather than adjoining another booth. 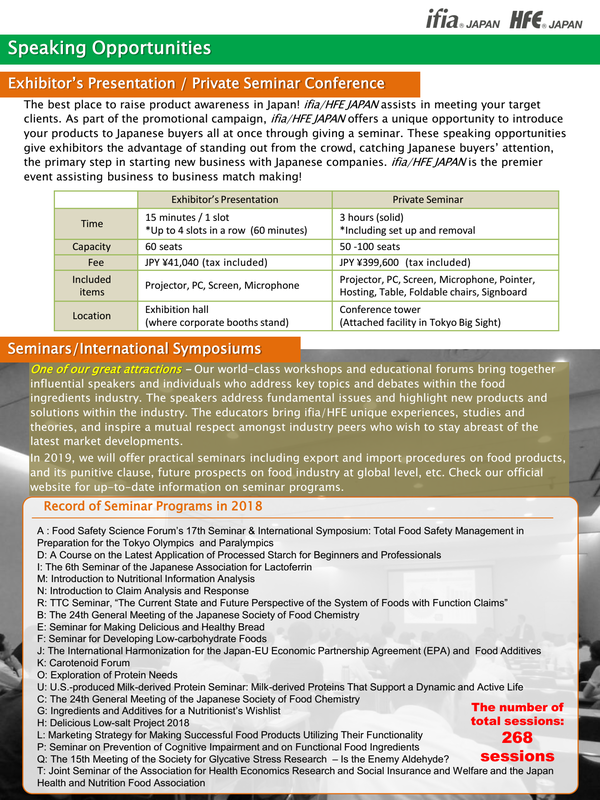 Throughout the show, a total of 270 Seminars / Presentations were given in 2018 and attracted professionals from the Food industry! Exhibitor should pay 100% of exhibit fee within 30 days upon application. Please be noted that we may stop accepting applications as soon as all booth locations are occupied. In case of overdue application, please inform Show Management. Changes of the payment schedule should be discussed with Show Management. Payment by note must not be accepted. For changes and cancellation of your booth, please refer to the regulation. Please download the [Contract Form / Regulation]. A Contract form must be filled out completely with referring to attached terms for exhibiting, and sent to ifia/HFE JAPAN Show Management.